Did you know that there are 133 million people living with invisible illnesses? 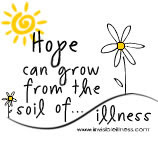 That's one in two people who live with a chronic illness each and every day. Diabetes is another of the many illnesses that are invisible. When you look at Sweetpea, you wouldn't guess that she has a disease. You might say, "She doesn't LOOK sick." And you're right. She's NOT sick. But she does have a disease. It's lurking there beneath the surface. The only hint might be the pump and cgm pouch she wears. But you might just think it's a fanny pack. For the most part, diabetes is invisible. You can't see what's happening beneath the surface. And that might be for the best, because if you could see it - well, my guess is that it's not pretty. Let me share with you a three day period in our crazy life. Tuesday night. Site change. We put on the numbing cream before bed, wait 45 minutes, and then quietly remove the old site and stick another needle into her tiny tush. It's become routine. We're fast and efficient. We don't think twice. Until 3 am. When she's HIGH. Give a correction... wait.... and she's not coming down. It was J's night to do on night patrol and he woke me up a little before 6 with the great news. We've got a bad site. We decided to change it out without waiting for the numbing cream. She was asleep... UNTIL we stuck yet another needle into flesh. Then she woke up screaming. And then we were all up. Luckily, she had no ketones and with the new site and a correction, she came down nicely and was at a good number by breakfast. Off to the Endo that afternoon! GREAT NEWS! Sweetpea's A1c was down to 7.5! Yipee! But the joy was short lived. She was really tired and grumpy from getting up so early and not having a good night's sleep. So were we. Then, 3 days later, it was time to change the site again. It was also time to change the Dexie site. So we went thought the routine again... numbing cream, filling a vial of insulin, prepping everything.... We switched cheeks... Dexie moved to the left cheek and the pump site moved to the right cheek. All was well..... or so we thought. Two hours after inserting Dexie, she needed calibrated. I did 2 bg checks and entered the data. It was about 1 am. She was high. I corrected and went to sleep. 3:30. Alarm goes off. I drag my sleepy body into her room. Dexie is saying bg is over 340. Not good. Bg check confirmed... I corrected. I checked the site. I feared we had another bad site going on but I wanted to see what the correction did. Sweetpea woke up after being poked and prodded so many times and wanted me to sleep with her. Fine. So I crawled into her little bed and fell asleep. I didn't set an alarm. I hadn't brought my phone with me. I often don't sleep well in her bed due to the flailing of small arms and legs... and I knew I'd hear Dex if it alarmed... so I went to sleep. THe next thing I knew it was morning. She was waking me up. Dexie said 390. It had never alarmed. This morning we were not so lucky. Her ketones were 2.4. According to the Precision Blood Ketone tester we use, anything over 1.5 "indicates that patient may be at risk for developing diabetic ketoacidosis (DKA). Patient should contact a healthcare provider immediately." Bad decision. One bad decision. Means life threatening consequences. As parents of CWD, we are continually forced to make decisions about our child's health. Many times in the middle of the night. Many times on very little sleep. And sometimes, in the middle of the night when you're so tired that you can hardly move, you make the wrong decision. And the children pay for it. It took all morning to get her bg down. And when it came down, it crashed. Then we couldn't keep it up. After being called out of church TWICE, we just left. I haven't heard a church service in WEEKS. If she's not high, she's low. Going back and forth multiple times means that I have no idea what the messages have been about. I've gotten NOTHING from church - except a feeling of frustration at how diabetes can take away so much from our lives. Frustration that we can't even go to church. Forget time alone. Forget actually spending any time with my husband that doesn't involve a diabetes task. Forget being able to take care of ME. Forget being able to think about anything else. What does this have to do with Invisible Illness week? Because to look at her, you'd never have known anything was wrong. She was acting fine. She didn't complain about feeling bad. She never does. She was a typical, happy, giggling, dancing, smiling 4 year old. Except what you couldn't see were ketones so high she could develop DKA quickly which can lead to coma and death. Don't kid yourself and say that it cann't happen. It can. And it has. And she could have "looked" fine. You couldn't see a stubborn low blood sugar. A low blood sugar that if left untreated could lead to loss of motor control, confusion, memory loss, passing out, coma... and death. All because of being without insulin for a few hours. The amount of insulin she missed is incredibly tiny.... almost invisible. And yet without it, she could have died. Check it out.. this is a unit. Sweetpea's basal ate over night is .125 units. The amount of insulin she missed is smaller than that drop. And one of the most difficult things is that no one sees what is going on in her body. Those who don't live with diabetes can't begin to understand what it's like to take care of a disease so silent and so deadly... and yet so invisible. Being invisible makes it appear mild or tame. Don't be fooled. That makes it even more of a threat. That last paragraph was an AMEN moment for me! Everyone has something they are dealing with, something invisible that we just cannot understand. So a little patience and a willingness to give someone a break...that is the greatest kindness we can offer! YEP, I LOVE THE LAST PARAGRAPH. Kindness to everyone b/c we all are dealing with some sort of invisible illness or issue. I love that. Thank you Hallie. P.S. I hope you get some rest tonight without highs. I always get the feeling that people think we are being "dramatic" about the dangers of diabetes and insulin. We have explained (like everyone has) the in's and out's of the disease and answered countless questions regarding the disease...you can tell people don't get it. That's ok, I wouldn't have either I don't think. But the best "demonstration" I have done is exactly what you have in your picture. I think it has more impact than the blood drop on the end of the finger. Less than a drop of clear liquid injected just under the skin is the very thing my daughter is missing that leaves her vunerable to death at any time, and it's that little tiny spit (if you will) that gives her life many times over a day...amazing to me and I've received more ah-ha looks from that little demonstration than any words have received! Sorry to go on and on here, but you have hit the nail on the head for me in your post! By the way Ellie has been skyrocketing too, maybe change of weather??? Touch of allergies??? Peace to you tonight...thanks for a wonderful post! @sfincham - I KNOW! I even re read this post a few times wondering if people would think I was being overly dramatic.... but knowing that I really wasnt... just being honest. I think people think that insulin is a cure-all and as long as you take it, things are totally fine and totally normal. I can't blame... I thought it too. It's just hard to get people to realize the severity when the person with the disease looks and acts totally "normal". Ah, well... I'm just glad I have those of you really GET IT! Thanks for reading! Coming from someone with type 1 diabetes, we make the same "mistakes" about the middle of the night decisions and I know that every misstep I take has consequences. Not sure if it helps to know that I feel just as guilty, scared and helpless in the face of such situations, but I am happy to hear that your daughter has someone like you to watch over her. HA! Dramatic....I'LL SHOW YOU DRAMATIC!!!!!! I just posted about a HORRIFIC low we survived last night. Yes, everyone is battling something! We all have our own issues. If only, we all also had love, kindness, respect and understanding. "Just keep in mind.... everyone is battling something. And most of the time, our demons are invisible. Maybe we should all treat each other will a little extra kindness and a little extra love." how often do we tend to forget that everyone is dealing with something? maybe if we all tried to have a little bit more compassion the world would be a little bit more of a gentle place. You are so good with your words. We get it. We understand that people are dealing with things that are invisible. Sometimes I think I (without thinking) try to make Ally's D invisible. I think that people don't want to see it, so I don't let them.